Far away on Wilde Island, Princess Rosalind is born with a dragon claw where her ring finger should be. To hide the secret, the Queen forces her to wear gloves at all times until a cure can be found, so Rosalind can fulfill the prophecy to restore the family to their rightful throne. But Rosalind’s flaw cannot be separated from her fate. When she is carried off by the dragon, everything she thought she knew falls apart. The dragon sees beauty in her talon where her mother saw only shame, and Rosalind finally understands what her mother has truly denied her. Carey has written a stunning portrayal of the complex relationship between a mother and daughter in a lyrical novel sure to thrill readers who love fantasy—and those who don’t. Princess Rosalind has lived her life in shame of the dragon claw she was born with. Every day she must don her golden gloves to hide her mark in order to be seen as the rightful heir to the throne of Wilde Island. Her mother, Queen Gweneth, is the only living soul who has seen the claw upon Rosie's finger, and she wishes to keep it that way. She will do anything in her power to keep the throne to Wilde Island safe, as well as the shame of the hideous claw from prying eyes. Rosalind is captured by a fearsome dragon, and whisked away to Dragon's Keep. There she learns that her hideous claw is beautiful in the eyes of the dragon's, and for the first time in her life feels as though it may not be a curse, but a sign of a new fate. Rosalind barters for the safety of her people, while also building a bridge between her world and theirs. It is all she can think of that will keep both her people, and herself, alive. The first thing that attracted me to this novel was the cover. I found it both disturbing and beautiful at the same time, which was a wonderful depiction of the feelings portrayed by the characters in this book. I love how the dragon in the background is transfixed by the claw upon the princess's hand. What one sees as something hideous, can obviously be seen as something beautiful in someone else's eyes. Rosalind's character seemed as though she was genuinely kind-hearted, and would do anything for those around her. While she watched people within her town throw hatred towards the dragons, she found it in her heart to love them, despite her cursed hand. Would her townspeople still love her with the mark of a dragon? Would they accept her for what she was, or burn her at the stake for being disfigured? I personally had to find out, and was thrilled with the outcome of the story. Another thing I loved about this book, was the language it was written in. There was nothing modern about the writing of this book, and this is what made it even better. The way the words were written only made the story come to life even more. It was a wonderful fairy tale that I would recommend to those who love stories filled with princesses, and dragons. Clicking on the cover and title links of this book will redirect you to Amazon.com. If you choose to purchase Dragon's Keep after clicking on these links I will receive a small percentage of the profits. Saws like a interesting premise. Nice review!! 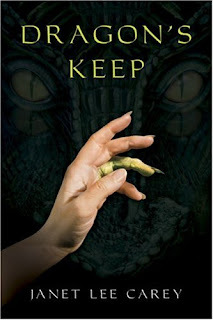 I was just reading Janet Lee Carey's website, and it says that she is writing a sequel to Dragon's Keep as well. I'm looking forward to that!